Fishermen and others interested in federal fishery issues are encouraged to provide public comments on a number of management options currently being considered by members of the South Atlantic Fishery Management Council. Headquartered in North Charleston, SC, voting members of the Council include recreational, commercial, and charter fishermen, as well as representatives from each of the four southeastern states marine resources agencies and NOAA Fisheries. The Council will conduct a series of public scoping webinars in August to provide an overview of specific management options under consideration and provide an opportunity for informal discussion and formal comment. Written comments are also being accepted. Members of the public are encouraged to use the online public comment form to submit written comments. Copies of scoping documents, video presentations, links for webinar registration, public comment forms, and other information will be posted to the Councils website at: http://safmc.net/safmc-meetings/public-hearings-scoping-meetings/ as it becomes available. Written comments will be accepted until August 17, 2018. Note: Public scoping documents, presentations, webinar registration, and the online public comment form will be posted to the Councils website two weeks prior to the beginning of the first webinar. Registration for each webinar is required. Note: Public scoping documents, presentations, webinar registration, and the online public comment form will be posted to the Councils website two weeks prior to the beginning of the first webinar. Registration is required for each webinar. Note: Public scoping documents, presentations, webinar registration, and the online public comment form will be posted on the Councils website two weeks prior to the beginning of the first webinar. Registration is required for each webinar. 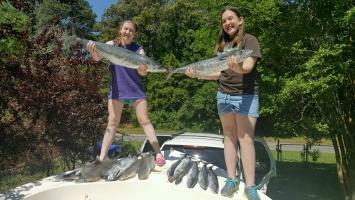 Written comments may also be submitted to: Gregg Waugh, Executive Director, South Atlantic Fishery Management Council, 4055 Faber Place Drive, Suite 201, N. Charleston, SC 29405. For additional information visit: http://safmc.net/safmc-meetings/public-hearings-scoping-meetings/ or contact Kim Iverson, Public Information Officer at Kim.Iverson@safmc.net or Cameron Rhodes, Outreach Specialist at Cameron.Rhodes@safmc.net.